Having spied the most delicious looking tuna over the weekend, and also noticing that samphire was also available, I couldn't help but scoop up both items. Alongside of smoked salmon, seared tuna has to be one of my favourite forms of fish (sushi comes in a close third). Samphire is a relatively new discovery for me, which I stumbled across in my search for one of my favourite italian vegetables, broccoletti (or rapini), which is a form of broccoli. Samphire bears some resemblance to broccoletti, however, the taste is very different. Make sure the tuna is extremely fresh when you make this, and ideally sushi-grade. It should be as red as possible and definitely shouldn't smell. This is a perfect weekday treat as it is on the table in under 5 minutes. Brush a little oil onto a griddle then heat until it starts to smoke. While the griddle is heating, steam the samphire for 3 minutes then toss in a little olive oil, salt and pepper. Go easy on the salt - samphire itself is quite salty. Once the griddle is hot, sear the tuna on both sides for about 30 seconds a side, then remove from the heat and slice into 1cm strips. 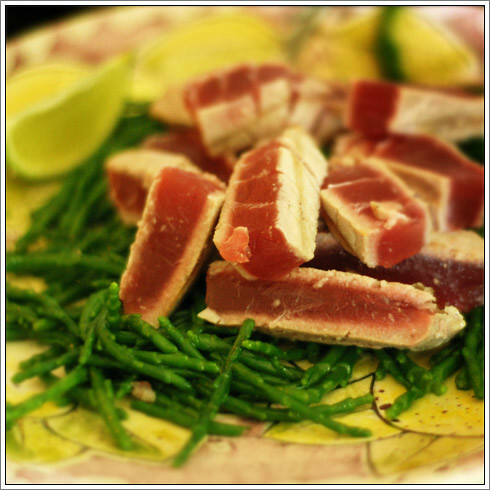 Place the samphire on a plate and then arrange the seared tuna on top of it. Squeeze the lime juice over the tuna and samphire and serve immediately. I've had it in pubs where I've nearly been put off - it's already quite salty, so it really didn't need the addition of anchovy & capers which the pub in question added to it. I like it best when steamed, tossed in a little olive oil & lemon juice with a grind of black pepper. No extra salt! My other half is also less enamoured with it as a vegetable, so I think it's quite a select taste. Samphire is also a relatively new discovery for me. I like the pairing with tuna here!